I love the ominous cover for All The Lovely Children by Andrew Nance. How could I resist picking this up for a creepalicious read? I thought All The Lovely Children by Andrew Nance was going to be ugly and the Prologue hooked me, creating fear and suspense from the opening words, proving me right. Charly was heading home to Temperance. You know, one of those small towns where everyone knows everyone’s business, except for the killer running AMOK. Charly knew all the ins and outs of catching a killer, since she had begun detecting at a very young age. Think Nancy Drew. She had killed the Snatcher, so Kit, an old friend and now the sheriff of Temperance, asked for her help in catching the Copycat Killer. Young or grown, she has the same rebellious, do it myself attitude that gets her in one dangerous situation after another. I love her, no matter how impulsive and reckless she can be. The suspense builds in the past and the present as the book goes from 1959 to 1982 and back again. Children are missing…murdered…what can be worse that that? I can picture a grown up Charly, sitting on the couch with the 44 Ruger balanced on her knee, pointing the gun at… LOVE it! I know the writing is excellent when images pop into my mind while reading a book. Oh man. I didn’t think Andrew Nance would take me here, but I’m stunned, shocked, sad and sickened. I am only at 80%, so I feel he has more surprises in store for me and I am eager to get to it. We also have a little of the supernatural making an appearance. She sees the dead. It plays more of a cameo role, leaving the story seeming all too real. I had thought of the final twist, but Andrew caused me to disregard it, leading me to believe I was walking down the wrong path…then, POW, in my face. Well, Andrew. You kept me on pins and needles from beginning to end. The writing was super and I do love a little romance with my danger and suspense. The characters were fantastic and I must say, that villain, LOVE, LOVE, LOVE it. Nothing beats a mind blowing villain. 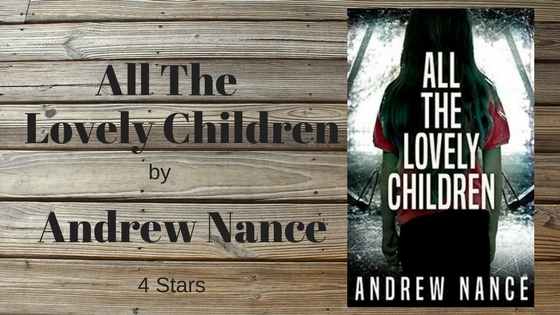 I voluntarily reviewed a free copy of All The Lovely Children by Andrew Nance.